This riff blues is right in the pocket, characteristic of Norman's songs at this tempo. A solo piano arrangement is available with Norman's own voicings as well as audio & video of him playing a duo with bassist Daryl Johns. A classic hard-bop blues riff, taken here at a medium slow tempo that rolls along. The head develops a two-measure riff that rises and quickly falls; the descending diminished arpeggio at the beginning of the tenth measure is a characteristically slick, Simmonsian touch. Norman kept the rhythmic set up of his intro the same for our three editions (lead sheets, Piano/Bass Duo and Solo Piano Arrangement); where it goes after the first measure, however, varies by the performance, as you can see by comparing our C treble clef lead sheet with the Solo Piano Arrangement and the Piano Duo part. Note that the lead sheets for the Al Grey "Fab" recording are exactly the same as the lead sheets available for this trio version. To prevent multiple purchases of the same lead sheet, the selection boxes will automatically be checked. Try it, it's easier to see it than explain it. Norman's "Midnight Creeper" trio recording has a fade out ending, so for our lead sheets we've used the ending from Norman's arrangement for the Al Grey "Fab" recording. This is essentially the same as the ending you'll find in both the Solo Piano Arrangement and the Piano/Bass Duo arrangement, but again, careful comparison will show slight differences, which is part of what jazz is all about. Whether playing this in a trio format, as in this recording, or with additional melodic instruments also playing the melody, as in the Al Grey recording, or in a duo format, as in the recording with bassist Daryl Johns, the pianist's role is always to simulate block chords while playing the melody. Norman's Solo Piano Arrangement gives you everything written out, and also works perfectly for the pianist with whatever instrumentation you're using. All our lead sheet editions also show the connecting grace notes that Norman plays on piano. Depending on the instrument, other instrumentalists should not be concerned trying to playing all these grace notes exactly as written, but it's nice to see what the pianist is playing so you can figure out the most effective way to make your notes gliss with the pianist's line. Pianists should also check out the description in the Piano Corner tab. The C bass clef edition is designed for the trombonist or other bass clef melody instruments. We recommend that bassists get the Bass part from the Piano/Bass Duo arrangement, which shows how bassist Daryl Johns dealt with the grace notes. Check out the Bass Corner tab on the Piano/Bass Duo recording for more details. Milljac is Norman Simmons' own record label. "Midnight Creeper" was the first Milljac album, and only Norman's third as a leader. His second album as a leader, "Ramira The Dancer" from 1976, featured the same trio with percussionist Ralph Dorsey added; the next two Milljac albums also featured the same rhythm section with trumpeter Jimmy Owens and saxophonists Clifford Jordan and Frank Wess. This rhythm section first played together with vocalist Betty Carter in the late '60s. Solo Piano Arrangement In the process of becoming an accomplished jazz pianist, pianists may run into situations where they need to be able to simulate moving block chords with the melody doubled an octave apart. Midnight Creeper is a perfect example of this. Most often, block chords for every melodic note won't work for the pianist. Norman's arrangement shows you some of the tricks you can use to keep the melody going while simulating block chords. Norman's solo piano arrangement clip contains the intro (which rhythmically starts off the same as Norman's trio recording). The arrangement ends rhythmically like his later arrangement for the Al Grey "Fab" recording. The melody is mostly voiced in block chords spanning an octave; on the duo recording the bass doubles the melody and on the trio recording, the bass also plays the melody on the last chorus. This solo piano recording was made by pianist Kenny Drew Jr. in 2009. At the time Kenny was living in Florida, but he came to NY at the request of Don Sickler to record some of our catalog's solo piano arrangements. Norman Simmons was intrigued by the idea of another pianist playing his arrangements, so he wrote a few more and came to the session, at engineer Rudy Van Gelder's Englewood Cliffs, NJ, studio. This version is rather faster than Norman's original trio version. The audio clip begins with the intro, which is different from the original; it contains one-measure stop-time breaks for the piano. The melody is played slightly differently from the way it is written in our lead sheet: the first note of the fifth measure, F, is played on the downbeat rather than anticipated on the "and" of beat 4, and the last beat of the ninth measure is two eighth notes (D and F) rather than a triplet with D♭, D and F. The triple grace note in the second, fourth, sixth, and eighth measures is not entirely possible on brass instruments; they would play more of a glissando. With this instrumentation, however, the grace notes are heard as written because of the guitar and alto sax, which can articulate them cleanly while the three trombones (two slide and one valve) give their approximation. Note that the lead sheets for the Al Grey "Fab" recording are exactly the same as the lead sheets available for Norman's trio version. To prevent multiple purchases of the same lead sheet, the selection boxes will automatically be checked. Try it, it's easier to see it than explain it. Norman's "Midnight Creeper" trio recording has a fade out ending, so for our lead sheets we've used the ending from his arrangement for the Al Grey "Fab" recording. This is essentially the same as the ending you'll find in both the Solo Piano Arrangement and the Piano/Bass Duo arrangement, but again, careful comparison will show slight differences, which is part of what jazz is all about. Whether playing this in a trio format, or with additional melodic instruments also playing the melody, as in this Al Grey recording, or in a duo format, as in the recording with bassist Daryl Johns, the pianist's role is always to simulate block chords while playing the melody. Norman's Solo Piano Arrangement gives you everything written out, and also works perfectly for the pianist with whatever instrumentation you're using. The marching trombone, played by Al Grey's son Mike on this recording, is a valved instrument that looks like a large trumpet, with the range and timbre of a trombone. "Fab" is the first of two Al Grey albums for the Capri label. One track on this album adds jazzleadsheets.com's Don Sickler on trumpet, as well as vocalist Jon Hendricks. Bassist J. J. Wiggins and guitarist Joe Cohn recorded together several times with Al Grey as well as on Joe's album "Shared Contemplations" (check out Something For Lisa from that album). 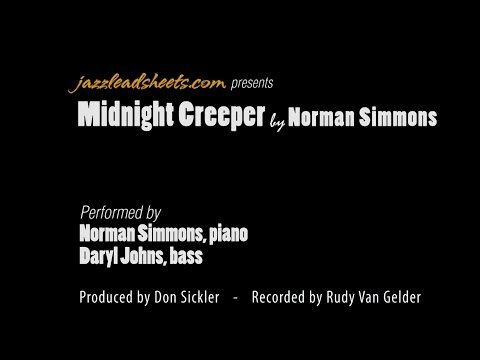 Midnight Creeper performed by composer Norman Simmons on piano with Daryl Johns on bass. Recorded by Rudy Van Gelder at the Van Gelder Recording Studio. Produced by Don Sickler. August 6, 2011. The piano/bass duo arrangement features the bass and piano playing the melody. Check out the video above, of Norman and bassist Daryl Johns, as they explore the composition. The Duo Piano part differs from the C treble clef lead sheet edition for the intro, first and second endings and the Coda. If the pianist wants to play the melody with the bassist, it's recommended that you also get Norman's Solo Piano Arrangement which shows all of his voicings, etc. An alternate way for a pianist to perform this duo is to use the indicated melody as a cue and just comp for the bass playing the melody, as Norman does in the out chorus of the video. Norman kept the starting rhythmic intro set up the same for the duo as our other two editions, but in this arrangement the bass is given the solo break to set up the melody. The Duo Bass part edition also shows how Daryl modified the three-note piano grace notes to make the grace notes work for him. See the Bass Corner tab for more details. August 6, 2011, was a challenging day for young bassist Daryl Johns. In the morning, Daryl was paired with pianist Don Friedman, recording six of Don's compositions. Then, after lunch, Daryl changed gears to work with pianist Norman Simmons. Although the video performance features both piano and bass playing the melody, an alternate approach is for the pianist to use the indicated melody as a cue and just comp for the bass playing the melody, as Norman does in the out chorus of the video. If the pianist wants to play the melody with the bassist, we recommend that you also get Norman's Solo Piano Arrangement which shows all of his voicings, etc. A clever jaunt on the blues form and voice leading, Midnight Creeper is a great example of how to take a small amount of material and turn it into a memorable composition. It fits excellently on the bass for it has a range only slightly larger than an octave and utilizes the open D and G strings throughout, allowing for a small amount of shifting. In addition, the performer will see the massive benefits of finding a line that works well and laying with it. The first eight bars of this song are comprised of the same repeated two-bar riff with only the pitch of the last note changing, yet it stays interesting. This kind of compositional technique can be put to use for an effective means of soloing, giving the player a framework to work from besides just the song's chord progression. Moreover, players can have a lot of success with swinging when there are fewer notes to worry about nailing and more time to groove!!! This song surely staples that point down on the paper, as the feeling here is one of dancing, joy and fun. Finally, often in bass playing it is the seemingly ant-sized and extraneous details that actually end up having an effect on the music that is as strong as the elephant's step! Here, that device is the grace note. These small, anticipatory pitches are a subtle yet noticeably-potent device that add a lot to a song's heart. We have discovered that Daryl Johns made a surprising but profound edit to the grace notes composed by Mr. Simmons. Instead of playing the three-note figure, Johns breaks it up into a two-note passage. Doing this smooths out the line for our large instrument, and keeps the rhythmic flow feeling steady, not clunky or disjointed (a potential problem when bass players start adding fills all over the place, as if they were getting paid by the note!) A smooth, warm, blues-drenched texture is the name of the game here and Johns in his own way adds to that aesthetic. Check it out for yourself and enjoy the innovation! Note that this would also be very effective with the bass playing the melody alone, with piano comping.